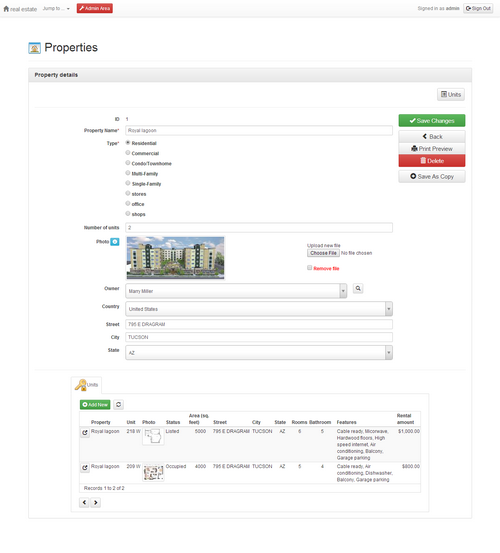 Online Rental Property Manager (ORPM) — Free, open source. Online rental property manager (ORPM) allows you to manage your rental properties, units, applications, leases and tenants. Add all details related to the tenants, i.e. references, rental history, employment history and income overview. ORPM was created using AppGini. So you can easily customize it to add/remove details or any extra functionality to fit your own requirements. ORPM is a responsive web-based application that you can access from your PC, tablet, mobile or any other device. Add, search and manage applications and leases. Manage landlords, properties, and units. Responsive Bootstrap apps that work beautifully on any device. Support for multiple users and user groups, with easy-to-configure per-table permissions. Export your data to CSV to work on them in Excel or other spreadsheets. Import already-existing data from CSV files through a powerful import wizard. Disclaimer: AppGini itself is not an open source application, but applications generated by AppGini can be distributed as open source with any license of choice. This is a PHP/MySQL web application that you run from a browser. You can install it either locally on your own PC, or to a web/intranet server. MySQL 3.x and above; or MariaDB 5.1 and above. If you don't have the above software installed, we recommend installing Xampp latest version. Download the latest release as a zip file from the download link at the top of this document. Extract the contents of the zip file into a folder inside your document root. (more info about how to find your 'document root'). In your web browser, go to: http://localhost/app-folder/ (change app-folder above to the name of the folder inside your document root where you extracted the zip in step 2). You should now see the setup wizard in your browser. Just follow the steps! Make sure your has access to a MySQL/MariaDB database. You might need to set up one in your server control panel. Please refer to your server documentation or the technical support staff for help on this if necessary. If your server has cPanel installed, here is a screencast explaining how to install your application using cPanel. Extract the contents of the zip file and upload them to a folder inside your server document root. (more info about how to find your 'document root'). In your web browser, visit http://server.com/app-folder/ (change server.com above to the actual domain name or IP address of your server, and change app-folder to the name of the folder inside your document root where you uploaded the files in step 2). Adding more fields to existing tables, or entirely new tables to fit your use cases. Changing the options/behavior of any table/field in your application. For more details, check the AppGini tutorials. You can also perform more advanced customization, like adding reports, changing validation rules, adding business logic, ... etc. through hooks. Please refer to the hooks documentation for more details.